In non-road mobile machinery (1), operated under variable or constant speed. Rotary piston engines (positive-ignition or compression-ignition). ‘Electronically controlled engine’ means an engine using electronic control to determine both the quantity and timing of injected fuel. ‘Maximum torque’ means the highest value of the net torque measured at full engine load. ‘Mechanically controlled engine’ means an engine using mechanical devices to determine the quantity and timing of the delivered fuel. 3.1. The application for approval of an engine type or an engine family with regard to the measurement of the net power shall be submitted by the manufacturer or by his duly accredited representative. An information document, including a list of reference fuels and, where requested by the manufacturer, any other specified fuels, fuel mixtures or fuel emulsions referred to in paragraph 5.2.3 and described in accordance with Annex 7 to this Regulation. Any additional information requested by the Type Approval Authority in the context of the type-approval application procedure. A description of the engine type and if applicable the particulars of the engine family referred to in Annex 5 of this Regulation. 3.3. The information folder may be provided in paper form or in an electronic format that is accepted by the technical service and the Type Approval Authority. 3.3.1. Applications submitted on paper shall be in triplicate. Any drawings shall be to an appropriate scale and in sufficient detail on size A4 sheets or in a folder of A4 format. Photographs (if any) shall show sufficient detail. 3.4. Manufacturers shall make available to the technical service responsible for conducting the type-approval tests defined in paragraph 5, an engine conforming to the engine type or, in the case of an engine family, to the parent engine characteristics described in Annex 5 of this Regulation. 3.5. In the case of an application for an engine family type-approval, if the Technical Service determines that, with regard to the selected parent engine, the application submitted does not fully represent the engine family described in Annex 5, manufacturers shall make available an alternative and, if necessary, an additional parent engine which is considered by the Technical Service to represent the engine family. 4.1. If the power of the engine submitted for approval pursuant to this Regulation meets the requirements of paragraph 5. below, approval of the engine type or family shall be granted. 4.2. An approval number shall be assigned to each engine type or family approved. Its first two digits (at present 02 for the Regulation in its form) shall indicate the series of amendments incorporating the most recent major technical amendments made to the Regulation at the time of issue of the approval. The same Contracting Party shall not assign the same number to another engine type or family. 4.3. Notice of approval or of extension or of refusal of approval of an engine type or an engine family pursuant to this Regulation shall be communicated to the Parties to the 1958 Agreement applying this Regulation by means of a form conforming to the model in Annex 2 to this Regulation. The number of this Regulation, followed by the letter ‘R’, a dash and the approval number to the right of the circle prescribed in paragraph 4.4.1. Where the statutory marking of the engine is not visible without removing parts, the vehicle manufacturer shall affix to the category T vehicle or the non-road mobile machinery, in a visible manner, a duplicate of the marking provided by the manufacturer. 4.5. 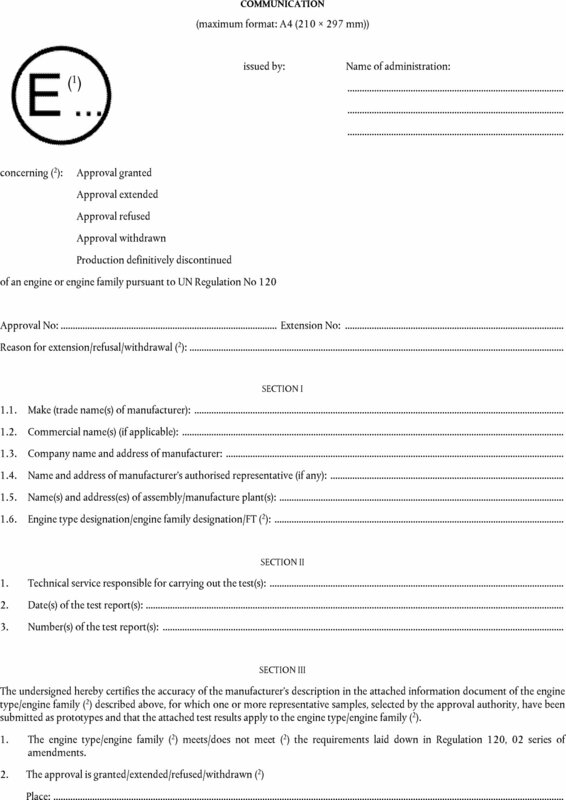 If the engine conforms to an approved type or family under one or more other Regulations annexed to the Agreement, in the country which has granted approval under this Regulation, the symbol prescribed in paragraph 4.4.1 need not be repeated; in such a case the Regulation and approval numbers and the additional symbols of all the Regulations under which approval has been granted under this Regulation shall be placed in vertical columns to the right of the symbol prescribed in paragraph 4.4.1. 4.6. The statutory marking shall be placed close to or on the data plate affixed by the manufacturer to the approved type. 4.7. Annex 3 to this Regulation gives examples of arrangements of approval marks. The unique engine identification number. The components liable to affect the power of the engine shall be so designed, constructed and assembled as to enable the engine in normal use, despite the vibrations to which it may be subjected, to comply with the provisions of this Regulation. 5.1.1. For this purpose, the engine net power measured in accordance with the test conditions and detailed technical procedures set out in Annex 4 to this Regulation, using the fuel(s) specified in paragraph 5.2.3 and corrected according to the power correction factors defined in paragraph 5 of Annex 4 of this Regulation shall not deviate by more than the tolerances specified in paragraph 5.3 from the power curves declared by the manufacturer. A run at the required fuel system settings to produce the manufacturer specified power for electronically controlled engines. The engine shall be equipped as specified in Table 1 of Annex 4 to this Regulation. 5.2.2. Measurements shall be taken at a sufficient number of engine speeds to define correctly the power, torque and specific fuel consumption curves between the lowest and the highest engine speeds recommended by the manufacturer. This range of speeds must include the rotational speeds at which the engine produces its rated net power, its maximum power and its maximum torque. The engine type or engine family shall, in addition, meet the requirements set out in paragraph 5.1.1 in respect of any other specified fuels, fuel mixtures or fuel emulsions included by a manufacturer in an application for type-approval and described in Annex 1 to this Regulation. 5.2.3.1. The fuel used shall be specified in the test report. 5.2.4. Measurements shall be carried out according to the provisions of Annex 4 to this Regulation. 5.2.5. The test report shall contain the results and all the calculations required to determine the net power, as listed in the appendix A.1 to Annex 2 to this Regulation together with the characteristics of the engine, as listed in Annex 1 to this Regulation. The net power declared by the manufacturer for the type of engine (or parent engine) shall be accepted if it does not differ by more than the values indicated in the table below, from the corrected values measured by the technical service on the engine submitted for testing. The reference power speed declared by the manufacturer shall not deviate by more than 100 min– 1 from the value measured by the technical service on the engine submitted for testing. For spark ignited petrol fuelled engines, the reference power speed declared by the manufacturer shall not deviate from the value measured by the technical service on the engine submitted for testing by more than 150 min– 1 for engines provided with governor and for engines without governor 350 min– 1 or 4 per cent, whichever is smaller. The specific fuel consumption curve declared by the manufacturer for the type of engine (or parent engine) shall be accepted if it does not differ by more than ± 8 per cent at all measurement points from the values measured for the same points by the technical service on the engine submitted for testing. In case of compliance of the parent engine to the conditions in paragraphs 5.3.1 and 5.3.2, the acceptance is automatically extended to all the declared curves of the family members. 5.4. Engine types and engine families shall be designed and fitted with engine control strategies in such a way as to prevent tampering to the extent possible. Engines approved under this Regulation shall be so manufactured as to conform to the type approved. The minimum requirements for conformity of production control procedures set forth in Annex 6 to this Regulation shall be complied with. 7.1. The approval granted in respect of an engine type or an engine family pursuant to this Regulation may be withdrawn if the requirements set forth in paragraph 6.1 above are not met or if an engine or an engine family bearing the approval mark does not conform to the type approved. 7.2. If a Contracting Party to the 1958 Agreement applying this Regulation withdraws an approval it has previously granted, it shall forthwith so notify the other Contracting Parties applying this Regulation, by means of a communication form conforming to the model in Annex 2 to this Regulation. 8.2. Confirmation or refusal of approval, specifying the alterations shall be communicated by the procedure specified in paragraph 4.3 above to the Parties to the Agreement applying this Regulation. 8.3. The Type Approval Authority issuing the extension of approval shall assign a series number for such an extension and inform thereof the other Parties to the 1958 Agreement applying this Regulation by means of a communication form conforming to the model in Annex 2 to this Regulation. If the holder of an approval completely ceases to manufacture an engine type or an engine family approved in accordance with this Regulation, he shall so inform the authority which granted the approval. Upon receiving the relevant communication that authority shall inform thereof the other Parties to the 1958 Agreement applying this Regulation by means of a communication form conforming to the model in Annex 2 to this Regulation. The Parties to the Agreement which apply this Regulation shall communicate to the United Nations Secretariat the names and addresses of the Technical Services responsible for conducting approval tests, and/or the Type Approval Authorities which grant approval, and to which forms certifying approval or extension or refusal of approval, issued in other countries, are to be sent. (*1) Note by the secretariat: for the purpose of this Regulation ‘speed’ means ‘engine speed’. Manufacturer's declaration and supporting data demonstrating that the engine control strategies fitted are designed in such a way as to prevent tampering to the extent possible, as referred to in paragraph 5.4. The information document shall have a reference number issued by the applicant. the information set out in Part C of Appendix A.1 to this Annex. When the same value for or description of a certain engine characteristic applies for several or all members of an engine family the corresponding cells may be merged. Where a ‘type’ of a component is requested, the information supplied shall uniquely identify the component; this may be a list of characteristic, a manufacturers' name and part or drawing number, a drawing, or a combination of the aforementioned or other methods that achieves the same result. 2.3.1. In the case of an engine type, the code is named engine type designation and shall clearly and unequivocally identify those engines presenting a unique combination of technical features for those items set out in Part C of Appendix A.1 to this Annex applicable to the engine type. 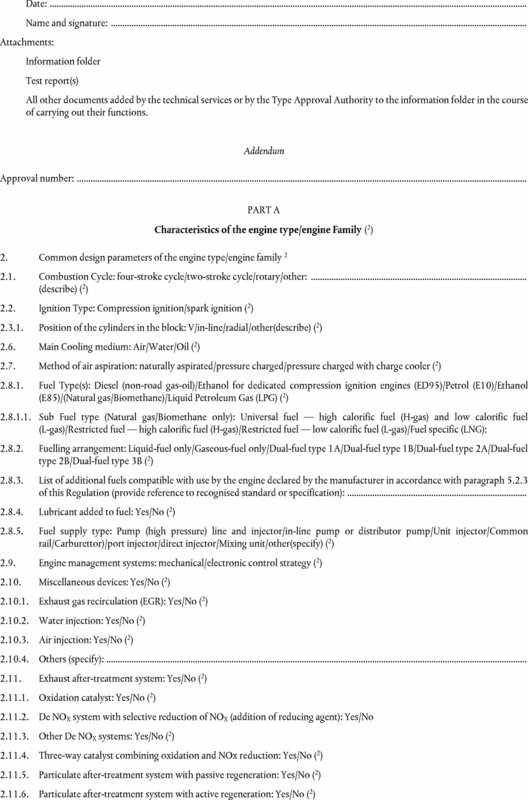 The engine family designation shall clearly and unequivocally identify those engines presenting a unique combination of technical features for those items set out in Parts B and C of Appendix A.1 to this Annex applicable to the particular engine family. The FT shall clearly and unequivocally identify those engines presenting a unique combination of technical features for those items set out in Part C of Appendix A.1 to this Annex applicable to the engine type within the engine family. 2.3.2.1. The manufacturer may use the same engine family designation to identify the same engine family under two or more engine categories. 2.3.2.2. The manufacturer shall not use the same engine family designation to identify more than one engine family under the same engine category. 2.3.4.1. The use of brackets and hyphens is permitted provided they do not replace a letter or a numeral. 2.3.4.2.1. The reasons for using such variable characters shall be explained to the technical service and Type Approval Authority. Explanatory note to Appendix A.1: All the templates below have been adapted from Appendix 3 to Annex 1 to the 05 series of amendments to UN Regulation No 96 and the corresponding numeration has been kept to facilitate their use by both manufacturers and Type Approval Authorities. If yes, complete section 3.11.6. In the case of combined catalyst and particulate filter both pertinent sections shall be filled. (1) Strike out the unused options, or only show the used option(s). (2) As defined in Annex 5 of this Regulation. (3) Refer to paragraph 2.3.13 in Annex 5 (engine family definition). 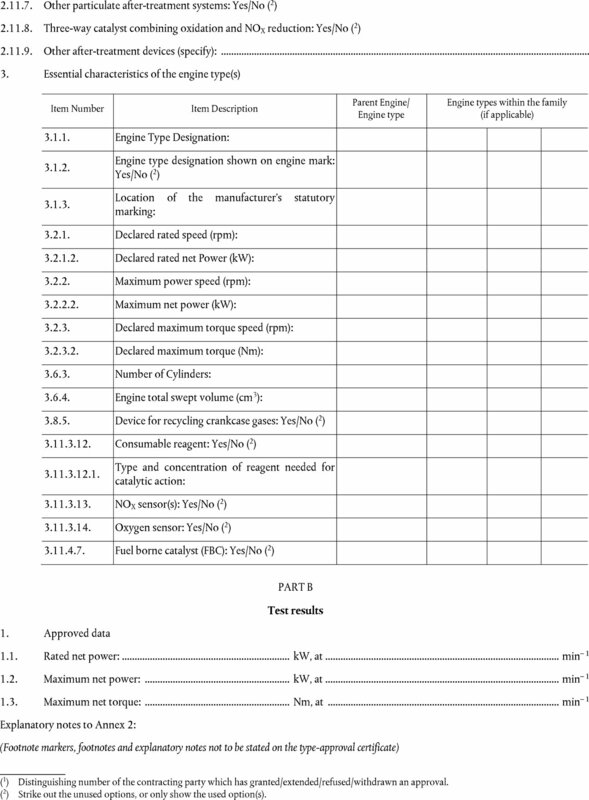 The undersigned hereby certifies the accuracy of the manufacturer’s description in the attached information document of the engine type/engine family (2) described above, for which one or more representative samples, selected by the approval authority, have been submitted as prototypes and that the attached test results apply to the engine type/engine family (2). 1. The engine type/engine family (2) meets/does not meet (2) the requirements laid down in Regulation 120, 02 series of amendments. All other documents added by the technical services or by the Type Approval Authority to the information folder in the course of carrying out their functions. (1) Distinguishing number of the contracting party which has granted/extended/refused/withdrawn an approval. (2) Strike out the unused options, or only show the used option(s). One test report shall be completed for each tests required for the type-approval. Each additional (e.g. a second speed on a constant speed engine) or supplementary test (e.g. another fuel is tested) will require an additional or supplementary test report. A.1.2.1. A test report shall contain at least the information set out in paragraph A.1.3. A.1.2.5. Where a ‘type’ of a component is requested, the information supplied shall uniquely identify the component; this may be a list of characteristic, a manufacturers' name and part or drawing number, a drawing, or a combination of the aforementioned or other methods that achieves the same result. A.1.2.6. The test report may be delivered on paper or in an electronic format agreed between the manufacturer, technical service and Type Approval Authority. (*1) The characteristic curves of the net power and the net torque shall be drawn as a function of the engine speed. (2) Calculated with the net power for compression-ignition and positive-ignition engines, in the latter case multiplied by the power correction factor. a = 8 mm min. The above approval mark affixed to an engine shows that the engine type concerned has been approved in the Netherlands (E 4) with regard to the measurement of the net power, pursuant to UN Regulation No 120 and under the approval number 021628. The approval number indicates that the approval was granted in accordance with the requirements of UN Regulation No 120 as amended by the 02 series of amendments. The above approval mark affixed to an engine shows that the engine type concerned has been approved in the Netherlands (E 4) pursuant to UN Regulations No 120 and 96 (1). The first two digits of the approval numbers indicate that, at the dates when the respective approvals were granted, UN Regulation No 120 was amended by the 02 series of amendments, and UN Regulation No 96 already included the 05 series of amendments. (1) The second number is given merely as an example. 1. These provisions apply to the method for determining the power curve at full load of an internal combustion engine operated under intermittent speed as a function of engine speed and the rated speed and rated net power of an internal combustion engine under constant speed. 2.1. The engine shall have been run-in according to the manufacturer's recommendations. 2.2. If the power measurement can be carried out only on an engine with the gearbox mounted, the efficiency of the gearbox shall be taken into account. During the test, the auxiliaries necessary for the engine operation in the intended application (as listed in Table 1) shall be installed on the test bench as far as possible in the same position as in the intended application. Where auxiliaries cannot be removed, the power they absorb in the unloaded condition may be determined and added to the measured engine power (see note h of Table 1). If this value is greater than 3 per cent of the maximum power at the test speed it may be verified by the test authority. Electronic control system, air flow meter, etc. Electronic control system, sensors, etc. Certain auxiliaries whose definition is linked with the operation of the non-road mobile machinery and which may be mounted on the engine shall be removed for the test. The setting conditions for the test to determine the net power are indicated in Table 2. In accordance with the manufacturer's production specifications, and used without further alteration for the particular application. 3.1. Data to be recorded are those indicated in appendix A.1 to Annex 2. Performance data shall be obtained under stabilised operating conditions with an adequate fresh air supply to the engine. Combustion chambers may contain deposits, but in limited quantity. Test conditions, such as inlet air temperature, shall be selected as near to reference conditions (see paragraph 5.2 of this annex) as possible in order to minimise the magnitude of the correction factor. 3.2. The temperature of the inlet air to the engine shall be measured within the inlet ductwork. The inlet depression measurement shall be made at the same point. The thermometer or thermocouple shall be shielded from fuel spray-back and radiant heat and located directly in the air stream. A sufficient number of locations shall be used to give a representative average of the inlet temperature. 3.3. The inlet depression shall be measured downstream of the entry ducts, air filter, inlet silencer or speed-limiting device (if fitted). 3.4. The absolute pressure at the entry to the engine downstream of the compressor and heat exchanger, if fitted, shall be measured in the inlet manifold and at any other point where pressure has to be measured to calculate correction factors. 3.5. The exhaust back pressure shall be measured at a point at least three pipe diameters downstream from the outlet flange(s) of the exhaust manifold(s) and downstream at the turbocharger(s), if fitted. The location shall be specified. 3.6. No data shall be taken until torque, speed and temperatures have been maintained substantially constant for at least one minute. 3.7. The engine speed during a run or reading shall not deviate from the selected speed by more than ± 1 per cent or ± 10 min, whichever is greater. 3.8. Observed brake load, fuel consumption and inlet air temperature data shall be taken simultaneously and shall be the average of two stabilised consecutive values which do not vary more than 2 per cent for the brake load. 3.9. The temperature of the coolant at the outlet from the engine shall be kept at the value specified by the manufacturer. If no temperature is specified by the manufacturer, the temperature shall be 353 K ± 5 K. For air-cooled engines, the temperature at a point indicated by the manufacturer shall be kept within + 0/– 20 K of the maximum value specified by the manufacturer in the reference conditions. 3.10. For C.I. engines, the fuel temperature shall be measured at the inlet of the fuel injection pump and maintained within 306-316 K (33-43 °C) for positive-ignition engines the fuel temperature shall be measured as near as possible to the inlet of the carburettor or assembly of fuel injectors and maintained within 293-303 K (20-30 °C). 3.11. The temperature of the lubricating oil measured in the oil pump or at the outlet from the coil cooler, if fitted, shall be maintained within the limits established by the engine manufacturer. 3.12. An auxiliary regulating system may be used if necessary to maintain the temperatures within the limits specified in paragraphs 3.9, 3.10 and 3.11 above of this annex. 4.1. Torque: ± 1 percent of measured torque. The torque measuring system shall be calibrated to take friction losses into account. The accuracy in the lower half of the measuring range of the dynamometer bench may be ± 2 per cent of measured torque. 4.2. Engine speed: 0,5 per cent of measured speed. 4.3. Fuel consumption: ± 1 per cent of measured consumption. 4.4. Fuel temperature: ± 2 K.
4.5. Engine inlet air temperature: ± 2 K.
4.6. Barometric pressure: ± 100 Pa.
4.7. Depression in inlet system: ± 50 Pa.
4.8. Back-pressure in exhaust system: ± 200 Pa. The power correction factor is the coefficient to determine the engine power under the reference atmospheric conditions specified in 5.2 below. The dry pressure is based on a total pressure of 100 kPa and a water vapour pressure of 1 kPa. is the absolute temperature in kelvins (K) of the air drawn in by the engine. If these limits are exceeded, the corrected value obtained shall be given and the test conditions (temperature and pressure) precisely stated in the test report. This factor indicates the effects of environmental conditions (pressure, temperature and humidity) on the air drawn in by the engine. The atmospheric factor formula differs according to the type of engine. This formula is valid for a value interval of qc included between 37,2 mg/(l.cycle) and 65 mg/(l.cycle). For qc values lower than 37,2 mg/(l.cycle), a constant value of fm equal to 0,2 (fm = 0,2) will be taken. in the case of naturally aspirated spark ignition engines. In other cases, an equivalent system may be used and a check should be made to ascertain that the intake pressure does not differ by more than 100 Pa from the upper limit specified by the manufacturer for a clean air filter. In other cases, an equivalent system may be installed provided the pressure measured does not differ by more than 1 000 Pa from the upper limit specified by the manufacturer. (3) If an exhaust brake is incorporated in the engine, the throttle valve shall be fixed in the fully open position. (4) The fuel feed pressure may be adjusted, if necessary, to reproduce the pressure existing in the particular engine application (particularly when a ‘fuel return’ system is used). (5) The cooling-liquid circulation shall be operated by the engine water pump only. Cooling of the liquid may be produced by an external circuit, such that the pressure loss of this circuit and the pressure at the pump inlet remain substantially the same as those of the engine cooling system. (6) The thermostat may be fixed in the fully open position. (7) When the cooling fan or blower is fitted for the test, the power absorbed shall be added to the results, except for engines where such auxiliaries are an integral part of the engine (i.e. : cooling fans of air cooled engines directly fitted on the crankshaft). The fan or blower power shall be determined at the speeds used for the test either by calculation from standard characteristics or by practical tests. (8) Charge air-cooled engines shall be tested with charge air cooling, whether liquid- or air-cooled, but if the manufacturer prefers, a test bench system may replace the air cooler. In either case, the measurement of power at each speed shall be made with the maximum pressure drop and the minimum temperature drop of the engine air across the charge air cooler on the test bench system as those specified by the manufacturer. (9) The power for electrical or other starting systems shall be provided from the test bed. (1) The tests may be carried out in air-conditioned test rooms where the atmospheric conditions may be controlled. In the case of engines fitted with automatic air temperature control, if the device is such that at full load at 25 °C no heated air is added, the test shall be carried out with the device fully closed. If the device is still operating at 25 °C then the test is made with the device operating normally and the exponent of the temperature term in the correction factor shall be taken as zero (no temperature correction). The technical features of an engine type shall be those defined in its information document drafted in accordance with the template set out in Annex 1. An engine type may be type-approved as a constant speed engine or as a variable speed engine, as defined respectively in paragraphs 2.3 and 2.32 of this Regulation. An engine family is characterised by design parameters. These shall be common to all engines within the engine family. The engine manufacturer may decide, which engines belong to an engine family, as long as the membership criteria listed in paragraph 2.3 of this Annex are respected. The engine family shall be approved by the Type Approval Authority. 2.2. Engine categories, operating mode (speed operation) and power range. 2.2.1. The engine family shall comprise only engine types of the same speed operation. Engines with the same block may belong to the same engine family as long as their bore centre-to-centre dimensions are the same. In order for engines with a swept volume per cylinder of ≥ 750 cm3 to be considered to belong to the same engine family, the spread of the swept volume per cylinder shall not exceed 15 per cent of the largest swept volume per cylinder within the engine family. In order for engines with a swept volume per cylinder of < 750 cm3 to be considered to belong to the same engine family, the spread of the swept volume per cylinder shall not exceed 30 per cent of the largest swept volume per cylinder within the engine family. Pressure charged with charge cooler. Number of valves per cylinder. The presence or absence of an ECU on the engine is regarded as a basic parameter of the engine family. The electronic governing of speed does not need to be in a different engine family from those with mechanical governing. The need to separate electronic engines from mechanical engines should only apply to the fuel injection characteristics, such as timing, pressure, rate shape, etc. All engine types within a dual-fuel engine family shall belong to the same type of dual-fuel engines as defined in paragraph 2 of Annex 7 of 05 series of amendments to UN Regulation No 96, and operate with the same types of fuel or when appropriate with fuels declared according to this Regulation as being of the same range(s). 3.1.1. Once the engine family has been agreed by the Type Approval Authority, the parent engine of the engine family shall be selected using the primary criterion of the highest fuel delivery per stroke per cylinder at the declared maximum torque speed. In the event that two or more engines share this primary criterion, the parent engine shall be selected using the secondary criterion of highest fuel delivery per stroke at rated speed. These requirements are consistent with tests to be held to check Conformity of Production (CoP), according to paragraph 6.2 of this Regulation. The methods of testing and measuring instruments shall be those described in Annex 4 to this Regulation. One engine has to be chosen. If after the test of paragraph 4. below, the engine is not considered as conforming to the requirements of this Regulation, two more engines have to be tested. In case of an approval granted to a family of engines the CoP shall be run on one member of the family, which is not the parent engine. In case of failure of the CoP test, the two more engines shall be of the same member type. Measurements shall be taken at a sufficient number of engine speeds to define correctly the power, torque and specific fuel consumption curves between the lowest and the highest engine speeds recommended by the manufacturer. The corrected values measured for the engine sampled shall not differ by more than the values indicated in the table below and ± 10 per cent for the specific fuel consumption. If the net power and fuel consumption figures of the second and/or third engine of paragraph 3 do not fulfil the requirements of paragraph 4 above, the production shall be considered not to conform to the requirements of this Regulation and the provision of paragraph 7 of this Regulation shall be put into effect. As an alternative to the reference fuels in this paragraph the equivalent reference fuels in paragraph 3.2.1 of this annex may be used. 3.2.2.2. The value of Sλ of the resulting blend of pipeline gas and admixture gas shall be within the range specified in Table A.7-1 for the specified reference fuel. The Methane Number (MN) of the resulting fuel blend. 3.2.2.4. The requirements of Appendices A.1 and A.2 shall be met in respect to determination of the properties of the pipeline and admixture gases, the determination of Sλ and MN for the resulting gas blend, and the verification that the blend was maintained during the test. (1) The values quoted in the specifications are ‘true values’. In establishment of their limit values the terms of ISO 4259 ‘Petroleum products — Determination and application of precision data in relation to methods of test’ have been applied and in fixing a minimum value, a minimum difference of 2R above zero has been taken into account; in fixing a maximum and minimum value, the minimum difference is 4R (R = reproducibility). Notwithstanding this measure, which is necessary for technical reasons, the manufacturer of fuels should nevertheless aim at a zero value where the stipulated maximum value is 2R and at the mean value in the case of quotations of maximum and minimum limits. Should it be necessary to clarify the questions as to whether a fuel meets the requirements of the specifications, the terms of ISO 4259 should be applied. (2) The range for the cetane number is not in accordance with the requirements of a minimum range of 4R. However, in the case of a dispute between fuel supplier and fuel user, the terms of ISO 4259 may be used to resolve such disputes provided replicate measurements, of sufficient number to achieve the necessary precision, are made in preference to single determinations. (3) Even though oxidation stability is controlled, it is likely that shelf life will be limited. Advice should be sought from the supplier as to storage conditions and life. (4) Additives, such as cetane improver as specified by the engine manufacturer, may be added to the ethanol fuel, as long as no negative side effects are known. If these conditions are satisfied, the maximum allowed amount is 10 per cent m/m. (5) The values quoted in the specifications are ‘true values’. In establishment of their limit values the terms of ISO 4259 Petroleum products – Determination and application of precision data in relation to methods of test have been applied and in fixing a minimum value, a minimum difference of 2R above zero has been taken into account; in fixing a maximum and minimum value, the minimum difference is 4R (R = reproducibility). Notwithstanding this measure, which is necessary for technical reasons, the manufacturer of fuels shall nevertheless aim at a zero value where the stipulated maximum value is 2R and at the mean value in the case of quotations of maximum and minimum limits. Should it be necessary to clarify whether a fuel meets the requirements of the specifications, the terms of ISO 4259 shall be applied. (6) Equivalent EN/ISO methods will be adopted when issued for properties listed above. (7) Should it be necessary to clarify whether a fuel meets the requirements of the specifications, the terms of EN 15489 shall be applied. (8) The values quoted in the specifications are ‘true values’. In establishment of their limit values the terms of ISO 4259 Petroleum products — Determination and application of precision data in relation to methods of test have been applied and in fixing a minimum value, a minimum difference of 2R above zero has been taken into account; in fixing a maximum and minimum value, the minimum difference is 4R (R = reproducibility). Notwithstanding this measure, which is necessary for technical reasons, the manufacturer of fuels shall nevertheless aim at a zero value where the stipulated maximum value is 2R and at the mean value in the case of quotations of maximum and minimum limits. Should it be necessary to clarify whether a fuel meets the requirements of the specifications, the terms of ISO 4259 shall be applied. (9) Equivalent EN/ISO methods will be adopted when issued for properties listed above. (10) A correction factor of 0,2 for MON and RON shall be subtracted for the calculation of the final result in accordance with EN 228:2008. (11) The fuel may contain oxidation inhibitors and metal deactivators normally used to stabilise refinery gasoline streams, but detergent/dispersive additives and solvent oils shall not be added. (12) Ethanol meeting the specification of EN 15376 is the only oxygenate that shall be intentionally added to the reference fuel. (13) The actual sulphur content of the fuel used for the Type 1 test shall be reported. (14) There shall be no intentional addition of compounds containing phosphorus, iron, manganese, or lead to this reference fuel. (15) The ethanol content and corresponding oxygen content may be zero for engines of category SMB at the choice of the manufacturer. In this case all testing of the engine family, or engine type where no family exists, shall be conducted using petrol with zero ethanol content. (16) The values quoted in the specifications are ‘true values’. In establishment of their limit values the terms of ISO 4259 Petroleum products — Determination and application of precision data in relation to methods of test have been applied and in fixing a minimum value, a minimum difference of 2R above zero has been taken into account; in fixing a maximum and minimum value, the minimum difference is 4R (R = reproducibility). Notwithstanding this measure, which is necessary for technical reasons, the manufacturer of fuels shall nevertheless aim at a zero value where the stipulated maximum value is 2R and at the mean value in the case of quotations of maximum and minimum limits. Should it be necessary to clarify whether a fuel meets the requirements of the specifications, the terms of ISO 4259 shall be applied. (17) The actual sulphur content of the fuel used for the emission tests shall be reported. (18) Ethanol to meet specification of EN 15376 is the only oxygenate that shall be intentionally added to this reference fuel. (19) The unleaded petrol content can be determined as 100 minus the sum of the per cent content of water, alcohols, MTBE and ETBE. (20) There shall be no intentional addition of compounds containing phosphorus, iron, manganese, or lead to this reference fuel. (21) Balance shall be read as follows: balance = 100 – C3 – <C3 – >C4. (22) This method may not accurately determine the presence of corrosive materials if the sample contains corrosion inhibitors or other chemicals which diminish the corrosivity of the sample to the copper strip. Therefore, the addition of such compounds for the sole purpose of biasing the test method is prohibited. (23) At the request of the engine manufacturer, a higher MON could be used to perform the type approval tests. (25) Value to be determined at standard conditions 293,2 K (20 °C) and 101,3 kPa. (27) Value to be determined at 293,2 K (20 °C) and 101,3 kPa. (29) Value to be determined at 293,2 K (20 °C) and 101,3 kPa. (30) Inerts (different from N2) + C2 + C2+. (31) Value to be determined at 293,2 K (20 °C) and 101,3 kPa. (32) Value to be determined at 273,2 K (0 °C) and 101,3 kPa. (33) The engine shall not be required to be tested on a gas blend with a Methane Number (MN) less than 70. In the case that the required range of Sλ for GR would result in an MN less than 70 the value of Sλ for GR may be adjusted as necessary until a value of MN no less than 70 is attained. A.1.1.1. For the purpose of this Appendix, where required the composition of the gas shall be determined by analysis of the gas using gas chromatography according to EN ISO 6974, or by an alternative technique that achieves at least a similar level of accuracy and repeatability. A.1.1.2. For the purpose of this Appendix, where required the measurement of gas flow shall be performed using a mass-based flowmeter. A.1.2.1. The composition of the utility gas supply shall be analysed prior to the admixture blending system. A.1.2.2. The flowrate of the utility gas entering the admixture blending system shall be measured. A.1.3.1. When an applicable certificate of analysis is available for an admixture (for example issued by the gas supplier) this may be used as the source of that admixture composition. In this case the on-site analysis of that admixture composition shall be permitted but shall not be required. A.1.3.2. Where an applicable certificate of analysis is not available for an admixture the composition of that admixture shall be analysed. A.1.3.3. The flowrate of each admixture entering the admixture blending system shall be measured. A.1.4.1. The analysis of the composition of the gas supplied to the engine after leaving the admixture blending system shall be permitted in addition to, or as an alternative to the analysis required by paragraphs A.1.2.1 and A.1.3.1, but shall not be required. A.1.5.1. The results of the gas analysis according to paragraphs A.1.2.1, A.1.3.1 or A.1.3.2 and, where applicable, paragraph A.1.4.1, combined with the mass flowrate of gas measured according to paragraphs A.1.2.2 and A.1.3.3, shall be used to calculate the MN according to EN16726:2015. The same set of data shall be used to calculate Sλ according to the procedure set out in Appendix A.2 to this Annex. A.1.6.1 The control and verification of the gas blend during the test shall be performed using either an open loop or closed loop control system. A.1.6.2.1 In this case the gas analysis, flow measurements and calculations set out in paragraphs A.1.1, A.1.2, A.1.3 and A.1.4 shall be performed prior to the emission test. A.1.6.2.2 The proportion of utility gas and admixture(s) shall be set to ensure that the Sλ is within the permitted range for the relevant reference fuel in Table A.7-1. A.1.6.2.3 When the relative proportions have been set they shall be maintained throughout the engine test. Adjustments to individual flow rates to maintain the relative proportions shall be permitted. A.1.6.2.4 When the engine test has been completed the analysis of gas composition, flow measurements and calculations set out in paragraphs A.1.2, A.1.3, A.1.4 and A.1.5 shall be repeated. In order for the test to be considered valid the value of Sλ shall remain within the specified range for the respective reference fuel given in Table A.7-1. A.1.6.3.1 In this case the analysis of gas composition, flow measurements and calculations set out in paragraphs A.1.2, A.1.3, A.1.4 and A.1.5 shall be performed at intervals during the emission test. The intervals shall be chosen taking into consideration the frequency capability of the gas chromatograph and corresponding calculation system. A.1.6.3.2 The results from the periodic measurements and calculations shall be used to adjust the relative proportions of utility gas and admixture in order to maintain the value of Sλ within the range specified in Table A.7-1 for the respective reference fuel. The frequency of adjustment shall not exceed the frequency of measurement. A.1.6.3.3 In order for the test to be considered valid the value of Sλ shall be within the range specified in Table A.7-1 for the respective reference fuel for at least 90 per cent of the measurement points. per cent by volume of dilution gases in the fuel (i.e. : O2*, N2, CO2, He, etc.). As an alternative to the above equation, Sλ may be calculated from the ratio of the stoichiometric air demand of pure methane to the stoichiometric air demand of the fuel blend supplied to the engine, as specified below. Lambda-shift factor (Sλ) expresses the oxygen demand of any fuel blend in relation to oxygen demand of pure methane. Oxygen demand means the amount of oxygen to oxidise methane in a stoichiometric composition of reaction partners to products of complete combustion (i.e. carbon-dioxide and water). Therefore, any calculation that specifies the stoichiometric air demand may be used to express the Lambda-shift factor. (1) Stoichiometric Air/Fuel ratios of automotive fuels — SAE J1829, June 1987. John B. Heywood, Internal combustion engine fundamentals, McGraw-Hill, 1988, Chapter 3.4 ‘Combustion stoichiometry’ (pp. 68 to 72).